Such a beautiful & fun dress! 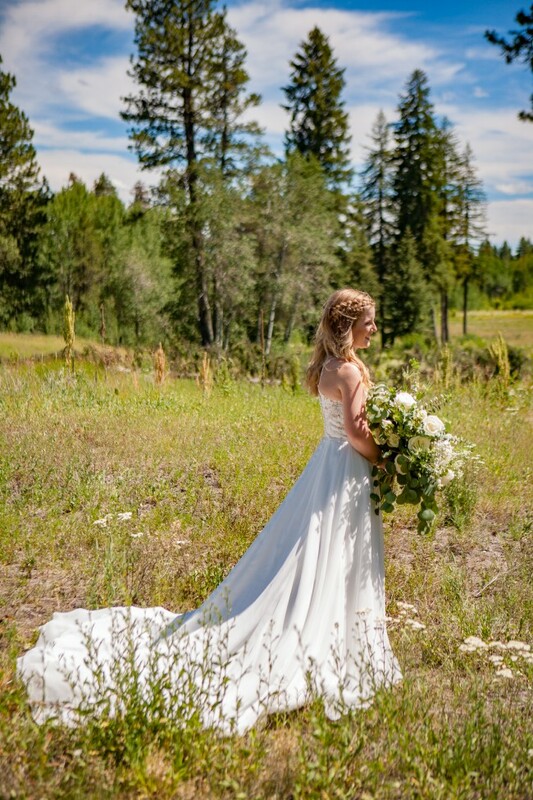 This dress was perfect for my rustic mountain wedding. The bodice has beautiful lace detail and buttons down the back and the skirt was so flowy and looked amazing with the breeze in our outdoor photos! The slit was the perfect fun addition to the dress and showed off my Old Gringo boots perfectly! My seamstress did add button closures to the top of the slit so that I could have it slightly closed during our chapel ceremony and then open it up for the reception. The dress was professionally dry cleaned and is in great condition. Since our reception and photographs took place outdoors there is slight wear to the hem of the skirt. The hem of the bottom layer of the skirt also shows slight discoloration. The dress was shortened to fit me at ~ 5'8" (I'm 5'6" and wore boots that had a 2" heel). The bodice was taken in slightly under the arms to fit my cup size (I'm normally a 34B). Clear button clips were added to the top of the slit (4 total, ~ 12 inches of slit) to close it up for my ceremony. Once you send a message, Kacie can invite you to purchase the dress.